Classes, Methods and Enumeration of System.IO Namespace? 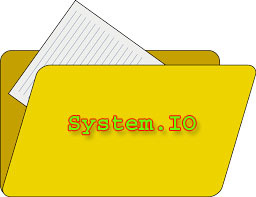 System.IO Namespace is a collection of classes, methods, enumeration and types that is responsible for reading and writing files and data streams. All the File Handling operations require System.IO namespace. BinaryReader Reads primitive data types as binary values in a specific encoding. BinaryWriter Writes primitive types in binary to a stream and supports writing strings in a specific encoding. BufferedStream Adds a buffering layer to read and write operations on another stream. This class cannot be inherited. Directory Exposes static methods for creating, moving, and enumerating through directories and subdirectories. This class cannot be inherited. To browse the .NET Framework source code for this type, see the Reference Source. DirectoryInfo Exposes instance methods for creating, moving, and enumerating through directories and subdirectories. This class cannot be inherited. DirectoryNotFoundException The exception that is thrown when part of a file or directory cannot be found. DriveInfo Provides access to information on a drive. DriveNotFoundException The exception that is thrown when trying to access a drive or share that is not available. EndOfStreamException The exception that is thrown when reading is attempted past the end of a stream. ErrorEventArgs Provides data for the FileSystemWatcher.Error event. File Provides static methods for the creation, copying, deletion, moving, and opening of a single file, and aids in the creation of FileStream objects. FileFormatException The exception that is thrown when an input file or a data stream that is supposed to conform to a certain file format specification is malformed. FileInfo Provides properties and instance methods for the creation, copying, deletion, moving, and opening of files, and aids in the creation of FileStream objects. This class cannot be inherited. FileLoadException The exception that is thrown when a managed assembly is found but cannot be loaded. FileNotFoundException The exception that is thrown when an attempt to access a file that does not exist on disk fails. FileStream Provides a Stream for a file, supporting both synchronous and asynchronous read and write operations. FileSystemEventArgs Provides data for the directory events: Changed, Created, Deleted. FileSystemInfo Provides the base class for both FileInfo and DirectoryInfo objects. FileSystemWatcher Listens to the file system change notifications and raises events when a directory, or file in a directory, changes. InternalBufferOverflowException The exception thrown when the internal buffer overflows. InvalidDataException The exception that is thrown when a data stream is in an invalid format. IODescriptionAttribute Sets the description visual designers can display when referencing an event, extender, or property. IOException The exception that is thrown when an I/O error occurs. MemoryStream Creates a stream whose backing store is memory. Path Performs operations on String instances that contain file or directory path information. These operations are performed in a cross-platform manner. PathTooLongException The exception that is thrown when a path or file name is longer than the system-defined maximum length. PipeException Thrown when an error occurs within a named pipe. RenamedEventArgs Provides data for the Renamed event. Stream Provides a generic view of a sequence of bytes. This is an abstract class. StreamReader Implements a TextReader that reads characters from a byte stream in a particular encoding. StreamWriter Implements a TextWriter for writing characters to a stream in a particular encoding. StringReader Implements a TextReader that reads from a string. StringWriter Implements a TextWriter for writing information to a string. The information is stored in an underlyingStringBuilder. TextReader Represents a reader that can read a sequential series of characters. TextWriter Represents a writer that can write a sequential series of characters. This class is abstract. UnmanagedMemoryAccessor Provides random access to unmanaged blocks of memory from managed code. UnmanagedMemoryStream Provides access to unmanaged blocks of memory from managed code. DriveType Defines constants for drive types, including CDRom, Fixed, Network, NoRootDirectory, Ram, Removable, and Unknown. FileAccess Defines constants for read, write, or read/write access to a file. FileAttributes Provides attributes for files and directories. FileMode Specifies how the operating system should open a file. FileOptions Represents advanced options for creating a FileStream object. FileShare Contains constants for controlling the kind of access other FileStream objects can have to the same file. HandleInheritability Specifies whether the underlying handle is inheritable by child processes. NotifyFilters Specifies changes to watch for in a file or folder. SearchOption Specifies whether to search the current directory, or the current directory and all subdirectories. SeekOrigin Specifies the position in a stream to use for seeking. WatcherChangeTypes Changes that might occur to a file or directory. In this chapter you learned about System.IO Namespace and its classes. In the next chapter you will learn how to read files using FileStream.